1. Trace your child's hand, then cut out two copies. My paper was double sided so I made sure that when the thumbs match up - the yellow side would be inside, and the blue side would be outside. 2. Cut out a strip of paper and fold it accordion style. Use letter rub-ons or stickers to add the words "I Love You" on the outside, and "This Much" on the strip of paper. Then Harvey and I made a little canvas (4 inches x 4 inches) to hang on the wall in Justin's office at work. I purchased small ones so we could add to them each year and hang them in one grouping. I prepainted the canvas in green, then set Harvey in the bathtub with blue paint and a brush and let him paint his own "picture." I did the footprint when he was about 9 months old. Then I wrote his name and age right on the canvas with a colored marker. Every year I'll have our kids paint their own picture on a matching canvas to add to the collection. I love, love, love the canvas idea! I'll have to look into that. i really like the "I love you this much" card! I want to make it for my dad! it's not too kiddish is it? ps- so you found out!! yeah we're excited! I haven't even told all of my family yet so I better get on that!! :) I've been sick, but definitely feeling better now! I love the card - I found it on Pinterest today and the kids and I made them for Fathers Day. I just posted mine on my blog (with a link back to you) Thanks for the inspiration!! LOVE the I love you this much card idea! Found you through Pintrest and I love, love, love your card! So making that for my girls!!! I love the card idea. I'm actually going to send it to my husband serving overseas. I hate always sending store bought cards so this will be perfect.. So Cute! Sharing this on my blog today! Thank you much for this wonderful card idea. Showed my daughter and she is going to make them as her special Christmas present to everyone. You saved me! I love this card! So sweet! Thank you for sharing! Oh my goodness this is so cute! I added a link of it on my blog. Check it out! Saw your card idea on Pinterest and can't wait to try it out with my family! that's just brilliant and oh so memorable! Of course I don't mind - thanks so much! Hiya I would like to use this on my site I have a free projects section that gets changed every month, As its mothers day here (Ireland) shortly I thought it would be a great one for younger kids. I will naturally reference you on it. I love the hands card. I wanted to make one for my friend who is leaving for six months for work, so I had to adapt it to make it a bit more adult and more appropriate for our situation, and I thought I'd tell you about it! I'm always telling him to tell me with his hands how much he likes something, so this card is perfect. I traced my hands, and instead of I love you this much I wrote "I'm gonna miss you this much!" I laminated the hands. Instead of the accordion paper I super glued the laminated hands to a metal slinky. So now when he is in his office, he can play with my hands slinky and think of how much I miss him! Oh. My. Word. That sounds SO cute!! I love that you adapted it to fit your situation. And the slinky... Brilliant!! Sorry for the late notice, but I am featuring this post of yours on Easy and Handmade Mother's Day gifts. You will have a text and photo link to your blog. The post will be on The Better Mom. Couldn't find another way to contact you. I hope it is OK and that you get a lot of traffic from it. I will be promoting the post all week. 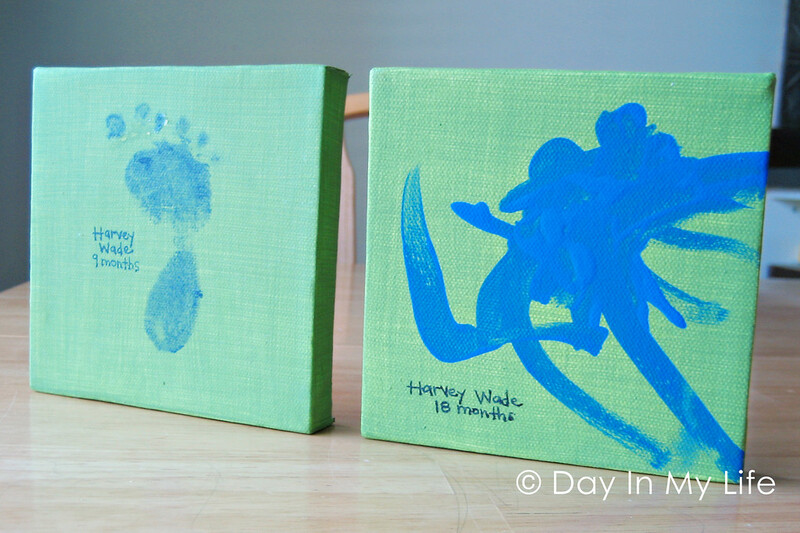 I have a daycare and love both the hand card and canvas ~ for Fathers Day coming up! Thanks for working this out for me so I didn't have to! I love both of your creative projects! Great ideas! May use them for the grandparents too!! I LOVE these ideas! I really want to do the canvas one in the future when I have the money to buy the materials. But I wanted to thank you for the "I love you this much" card-- I created my own today with some modifications, and I had so much fun doing it. I wrote a blog post about it at Equis Place and credited you with the original idea. So, again, thank you! My son's father loves it! Thank you for a wonderful idea, i also have a few Fathers day gift ideas you might want to check out. Such a wonderful card! Dads are special to us. They deserve something special as well. This card will surely complete his day. My heartiest and heartfelt fathers day wishes to all wonderful DADS around the world! Maybe you could use t-shirts as your canvas. That would be great. I'm going to do my own Grammy hands and send one to each of my granddaughters. We live in FL, they live in NY and PA. Think it will be cute for three tiddlers! Valentine's Day will be here soon, that's my goal! Being in love is, perhaps, the most fascinating aspect anyone can experience. Nice Pyar Ki Kahani Ever. This is such a clever idea! I just wanted to let you know that I am linking to this post for Mother's Day on www.simply-creative-kids.com if you don't mind. Hello Tiff! We would like to feature this in our blog, on a post entitled, "Creative Handmade Mother's Day Cards". Can we use a photo to show what it looks like and a link to the tutorial? Thanks! Sure. Thanks for the link up! Great project we'd love to include your This Much Card on a Mothers Day Crafts for Kids article on www.mykidstime.com with credit and a link if that's ok with you. Great piece of Work .. We would love to include your card ideas to our blog on www.fathersdayevent.net . I love your handprint card! I've included it in my Father's Day Paper Craft round-up. Thanks for sharing your idea! Which local and/or online stores carry double-sided paper? Your work is wonderful, congratulations to the blog. moderninha wifi. Dr. Ekpen Temple Your spell worked and brought my husband back to me. You gave me support when I was feeling hopeless. I feel truly blessed to have found your email address. I sincerely hope others will take that leap of faith and let you help them as you have helped me, for those of you who want to contact him reach him on his email address: ( ekpentemple@gmail.com ) OR WHATSAPP +2347050270218 you will never regret contacting him… He is capable of restoring your relationship and marriage problems like he did for me. Very Nice Post & Good Job. click here to download android apps. Amazing ideas for kids, you can also check this to share with your readers, i hope you and all your readers like this. Hello sir how are you...? Really i love this card - I found it on Pinterest today and the kids and I made them for me this card i also posted on my blog short mothers day quotes this card.... Thanks for the inspiration!